Forestry experts called for a new approach to managing land and tackling climate change at Forest Day 6, held in Doha on the sidelines of the 2012 UNFCCC COP. Climate change needs to be dealt with across sector boundaries. Forests and forestry must be looked at through the lenses of agriculture, food security and broader sustainable development. It is time for forestry to come out of the forest and contribute more broadly. With more than 700 high-level attendees from governments, NGOs, donors and the international media, including 241 UNFCCC negotiators, the discussions centred on the need for a landscape approach to holistically tackle the challenges of climate change, food security and forest conservation. “It is time for forestry to come out of the forest and contribute more broadly,” said CIFOR Director General Peter Holmgren in his opening address. Will Steffen, Executive Director of the Climate Change Institute at the Australian National University, delivered the keynote speech on changing approaches to growth and sustainable development, placing special emphasis on climate and biodiversity. Other speakers covered topics such as finance, food security, and poverty reduction. For the first time, the event was held in conjunction with Agriculture, Landscapes and Livelihoods Day, exploring the potential of landscapes to offer sustainable solutions for climate change adaptation, mitigation and livelihoods. An additional 700 people watched the Forest Day live stream on the web, with a further 4,300 watching the videos of the panels on YouTube. International media covered the event extensively and CIFOR’s blog coverage of the COP received 93,000 pageviews in December and January. Overall, the social media campaign reached nearly 650,000 people. 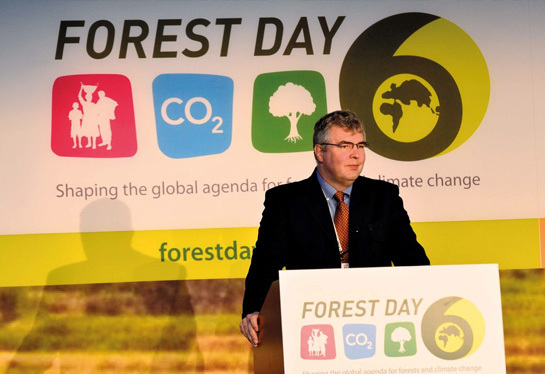 Some 94 percent of respondents to a survey on Forest Day 6 said they thought the event was “successful” or “very successful”, citing its value for networking, informing policy and exchanging knowledge.